CTCI MAC has cumulated experiences and innovative technologies in equipment fabrication more than 30 years. 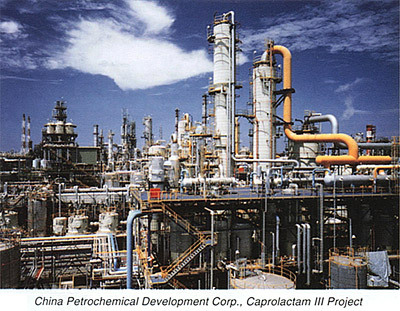 We provide service to Taiwan large and medium size enterprises such as CPC Corporation, Formosa Plastics, Taiwan power company, China Steel etc., and are capable of manufacturing wide varieties of stationary equipment such as: large and heavy tower, cylindrical drum/spherical storage tank, heat exchanger / HELIXCHANGER heat exchanger, HRSG boiler, surface condenser, silo also large LNG storage tanks, and Pipe fittings and steel structure. For quality management system, CTCI MAC are certified by American Society of Mechanical Engineers (ASME) to use N、NPT、NA、NS、U、U2、S、PP stamps on the boiler or pressure vessel we fabricated. CTCI MAC Pressure Vessel Inspectors can use “R” stamp for the repair of the ASME Code stamped pressure vessels. After April 2007 company spin off from CTCI, CTCI MAC still continue to supply the various of high quality static equipment to CTCI for its EPC project fabrication work, we also actively collaborate with International large famous companies enhance our fabrication ability to supply more advanced and large-scale equipment. Later in June.2011, CTCI MAC followed the collective business development strategy enacted by CTCI and merged with the engineering team of CTCI-Kaohsiung Operation Center (KOC). This reshape of CTCI MAC has provided a proficiently in refinery & petrochemical project for joined business operation and combines the experience and technology of Engineering, Project Management and Equipment Fabrication to become an EPC company able to provide the consistent service of so call “Total Solution” to our clients. T start with in 2011, we jointed the domestic EPC medium-sized market by completion of CPC No.10 HDS project in Ta-Lin Plant ; In 2016, we successfully completed the EPC Project for FPCC SAR#2 (330 tons/day) and had won the highly praise from owner for having fully met the requirement of high engineering quality, schedule control and secured safety. Then in 2017, FPCC HHCR construction project be taken over by CTCI MAC to do turn-key work, which is expected to be completed and operated in 2019. In recent years, professional maintenance of plant turnaround manages service for large and medium-sized factory has been in market demand. Thus, CTCI MAC is actively engaged in the establishment of maintenance business, dedicated to provide long-term maintenance services, and to assist the owners to debottleneck for performance improvement. As we have been awarded the Maintenance work for FPCC such as : Mai-Liao ARO-2 plant for general inspection, and FPCC ARO-1、ARO-2 plants general inspection work for a 2 years contract. With all these solid, successful projects as our reference, CTCI MAC continue successfully completed the turnaround work for CPC Lin-Yuan Naphtha Cracker NO.3 and NO.4 Plant in 2017 and 2018, while N.C. NO.3 were completed and turn over to owner 2 days ahead of scheduled completion date. These achievements were deeply affirmed by the owners. As CTCI MAC continues promoting the concept of plant turnaround management, we have received more and more positive response from our client. These achievements show our determination in expending our role in the maintenance business in the future. Today, CTCI MAC has more than 450 professional technicians and engineers and is capable of providing consistent full-service, from construction planning, engineering design, procurement, equipment fabrication, Test & Commissioning to maintenance work. CTCI MAC will keep providing superb quality service and best cost saving to satisfy customers’ demand. CTCI Machinery Corporation (CTCI MAC) is a member of CTCI Group. CTCI MAC not only has inherited the entire engineering philosophy from CTCI Engineering Corporation, but also will be strongly supported by the whole CTCI Group. Therefore, CTCI MAC has shown excellent business performance, well financial condition and outstanding engineering performance ability and great engineering achievements. Over the years, CTCI MAC has undertaken a number of significant engineering projects including engineering planning and design, supervision and construction. This also proof that our company is well prepared and ready to carried out any large-scale EPC projects. We have many experienced and skilled professionals in all disciplines. Since 2011, we have won the praises from our clients with receiving their thanks awards or bonus. Vision：The Best Engineering Service Partner for Our Customers. For good performance in the detail design, construction planning, progress, quality and safety management. The project construction planning, progress, quality and safety management had been well planned, controlled and performed smoothly, completion by 2 days earlier. Construction quality and safety and environmental performance are excellent. Completion by 3 days earlier, award with a certificate of appreciation. The project detail design, construction planning, progress, quality and safety management had been well planned, controlled and performed smoothly for subsequent process operations. Due to the tough working environment and by development special tooling that overcomes the problem of limited space inside equipment and enhances the accuracy of assembly work. Strict project management, HSE management, quality control, awarded the warrant for Zero accident, safety and successful construction. Completion by 3 days ahead schedule, been awarded by owner for outstanding performance.